People are suffering from 'clothes obesity'. Now-days many of us have cupboards full of clothes, books, shoes and other stuff which is just laying on the shelf being never used. Storage has no difference with premature death. Why don't we use them any more? Most of the time not because we do not like color, or model. It's just because we do not have time to use them. 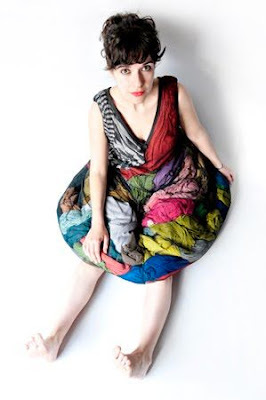 The design of Isabel Valdes Marin's dress allow you to wear many of your unused clothes at the same time. 'Matter of time' - one of the master projects of Design Academy Eindhoven 2011. 'Matter of time' is the artwork f social design which connects human needs with the real needs of our time. A Matter of Time: Black from Isabel Valdés Marín on Vimeo.